A flock of tiny, beautiful, and critically endangered captive birds have been released in the wild around Geelong and Wyndham, with researchers hoping it boosts their numbers. 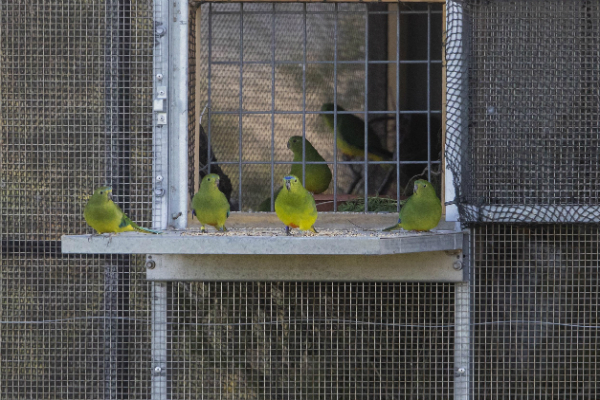 The Department of Environment, Land, Water and Planning (DELWP) have revealed that 20 of the Orange-Bellied Parrots will be released in the region from today. The tiny birds might be seen around the Western Treatment Plant area in Werribee, Avalon Coastal Reserve, or the Spit Nature Conservation Reserve. There are only around 50 of the little beauties left in the wild, and all make a long journey over the Bass Strait to breed. In order to boost their chances of breeding, researchers have also captured a small group of the parrots in Tassie and flown them to Melbourne. The DELWP program has seen success in the last two years, with flocks of ten Orange-Bellied Parrots seen in Victoria for the first time in ten years. “This program has allowed Orange-bellied Parrots to have a better outlook, with the potential of saving the birds from extinction in the wild,” said Natural Environment Program Officer Rachel Pritchard.